Andrew John Strauss OBE (born 2 March 1977) is a former English cricketer who played all formats of the game internationally, captaining England in all formats. He played county cricket for Middlesex County Cricket Club. A fluent left-handed opening batsman, Strauss favoured scoring off the back foot, mostly playing cut and pull shots. Strauss was also known for his fielding strength at slip or in the covers. He became the Director of Cricket for the England and Wales Cricket Board (ECB) in 2015, shortly before the sacking of Peter Moores. Having deputised for Michael Vaughan as England captain in 2006, Strauss was appointed on a permanent basis for the 2008–09 tour of the West Indies following Kevin Pietersen's resignation. He enjoyed success with three centuries, and retained the captaincy into 2009. Strauss captained the England team to a 2–1 victory in the 2009 Ashes, scoring a series total of 474 runs, more than any other player on either side, including 161 in England's first victory in an Ashes Test at Lord's in 75 years. He held the record for most catches by an outfield player for England – going past Botham and Cowdrey at Lords against South Africa in 2012 – until he was in turn overtaken by Alastair Cook. He relinquished the Test captaincy and retired from all forms of professional cricket on 29 August 2012, following his 100th test, which concluded a series defeat by South Africa that saw the England Test team lose their number one ranking. He left the job as the second most successful captain of England in terms of wins, behind only his former opening partner Michael Vaughan. At the end of his retirement press conference he received an unprecedented round of applause from the assembled media. Born in Johannesburg, South Africa, Strauss moved to the UK at the age of six. He was educated at Caldicott School, a boys' prep school in Buckinghamshire, followed by Radley College, a public boarding school for boys in Oxfordshire. He studied economics at the University of Durham, and wrote his dissertation on supermodular games. He graduated in 1998 with an upper-second class BA degree. During his early career, Strauss spent several years in the cities of Sydney and Adelaide in Australia, and briefly played first-grade cricket alongside Australian bowler Brett Lee. While in Australia he met his future wife, actress Ruth McDonald, whom he married in October 2003 and lived in Marlow, with their sons, Sam (born 4 December 2005) and Luca (14 July 2008). In December 2018, Ruth died after a battle with a rare form of lung cancer. Politically, Strauss is a Conservative, raising money for them in a charity auction. He was also rumoured as a potential Conservative candidate in the Corby by-election, 2012 although he did not run in the end. David Cameron tried to persuade Strauss to become an MP in 2013, but Strauss turned down the offer. Having played for the Durham University cricket team and the Middlesex second XI since 1996, Strauss made his Middlesex first XI debut in 1998, scoring 83 in his maiden first-class innings. Despite this, he made a quiet start: he averaged 24 and 30.5 in his first two first-class seasons, and he did not make his maiden first-class century until an innings of 111 not out two years after his debut. Thereafter, Strauss's stock rose quickly: his returns in 2001, 2002 and 2003 were 1211 runs at an average of 45, 1202 at 48 and 1529 at 51. He was appointed captain of Middlesex in 2002, following the retirement of Angus Fraser, and retained the post until the end of the 2004 season. In late August 2011, Strauss hit his highest first-class score of 241 not out against Leicestershire, beating his previous best of 177. Strauss returned home to start the 2004 English season but was chosen to make his Test debut for England after Vaughan sustained a knee injury in the nets. The initial plan was to promote Mark Butcher to the vacant opening batsman position and include Paul Collingwood in the middle order. Butcher declined to move up the order and batted third, meaning Strauss was asked to open the batting and Collingwood missed out on a place in the side. Vaughan's injury turned out to be fortunate for Strauss who, in his first Test innings, top scored with 112 and contributed 82 in the second innings before being run out, with Nasser Hussain taking responsibility for the dismissal. This put Strauss on a series of exclusive lists including being the second English player to score a century on his debut at Lord's, third opener to score a hundred on debut, the fifteenth English player to score a century on his debut, the first since Graham Thorpe in 1993 and only the fourth English player to score a century and half century on his debut. Strauss also made the first dismissal of the Test, catching Stephen Fleming off Simon Jones and was awarded Man of The Match for his efforts. The performance by Strauss excelled his role as a filler for Vaughan, leading to Hussain retiring from cricket allowing for Vaughan to move down the order and Strauss retaining the role of opener opposite Marcus Trescothick. Strauss' form declined over the series, with one half century in the second Test and his first Test duck along with a six in the third Test. As England returned home weary from an entire Winter without a series victory after the euphoria of the previous two years, they completed a subcontinental triumvirate when Sri Lanka arrived to prove that Asian dominance was not particular to the Indian subcontinent. With the captaincy crown returned to Flintoff, Strauss could focus solely on his batting prowess at the ground that made him famous. Opening once again with Trescothick, Strauss fell two short of a half century to the bowling of Muttiah Muralitharan at the stroke of lunch, allowing Cook to walk out to the wicket afterwards with company. Strauss went on to take the final wicket of Sri Lanka's first innings, Nuwan Kulasekara, catching him off Flintoff to allow England to enforce the follow-on which they could not capitalise on, forcing a draw. In the second Test, England took the lead with a victory after Strauss scored the second highest runs in both English innings, being controversially caught for 16 in the second off his pads. He recorded another half century in the third Test, though it was not enough to stave off a 134 run defeat. Once again he was offered the captaincy for the short form game, leading England in a tense, two run loss to Sri Lanka where he put on an opening partnership with Trescothick for 59. Under Strauss' captaincy England endured a five match whitewash where Strauss failed to muster even fifty though it was acknowledged that the team, particularly the bowling side, were under strength. Strauss headed to the 2010–11 Ashes series hoping to join Mike Brearley and Len Hutton as the only England captains to win the Ashes both home and away, and the first to win an Ashes series in Australia since Mike Gatting in 1986-7. Strauss won the toss on the opening morning at the Gabba (Brisbane) and elected to bat, however was caught at gully for a third-ball duck. England's first innings total of 260 was not enough, and Australia built a 221-run first innings lead. Despite the large deficit, England fought back; Strauss and Cook scored 188 for the first wicket. Strauss made his 19th Test hundred, eventually out for 110; stumped for the first time in his Test career. Fellow-opener Cook scored an unbeaten 235 and Jonathan Trott 135, also unbeaten, as England declared at 517–1. Australia scored 107–1 in their second innings before a draw was declared. In April 2015, a reorganisation at the ECB saw Paul Downton's role of managing director made redundant. Strauss was appointed to the newly created role of director of England cricket in May 2015 and his first act was to sack the incumbent coach Peter Moores. Another early move was to rule out an imminent return to the England team for Kevin Pietersen, who had fallen out with the previous management team. He oversaw the appointment of Trevor Bayliss as coach, and encouraged a greater emphasis to be given to limited overs cricket. Strauss resigned his position on 3 October 2018, citing a wish to spend more time with his wife while she was undergoing treatment for cancer. His wife, Ruth, died of lung cancer aged 46, on 29 December 2018. An innings-by-innings breakdown of Strauss' Test match batting career, showing runs scored (blue and orange bars) and career batting average (red line). An image showing a 10 innings moving average is also available. Both are current as at 14 January 2012. ^ a b c Sources differ as to the number of innings in which Strauss has not been dismissed – 8 times according to Cricinfo and 7 times according to Howstat, as at 24 January 2012. In the match against South Africa held on 11 February 2005, Cricinfo records a score of 0* but also confirms that he did not face a delivery. Howstat records that Strauss "did not bat" in this match, which is why the innings does not appear in his ODI batting graph. This explains the apparent discrepancy between the data table and batting graph with regard to innings in which Strauss was not out. Note also that his score of 74* in 12 April 2006 match against India is counted as a 'not out' innings by both Cricinfo and Howstat as he was not dismissed, but his innings actually ended when he retired hurt. ^ "Andrew Strauss". Cricinfo. Retrieved 9 March 2011. ^ Andrew Strauss appointed to steer England cricket’s strategy, Peter Moores sacked. AFP. 9 May 2015. ^ a b c d "Cricinfo – Players and Officials – Andrew Strauss". Content-uk.cricinfo.com. Retrieved 10 August 2013. ^ "New Zealand in England Test Series – 1st Test England v New Zealand". CricInfo. 24 May 2004. Archived from the original on 25 June 2009. Retrieved 22 June 2009. ^ "1st Test: South Africa v England at Port Elizabeth, 17–21 December 2004". Uk.cricinfo.com. Retrieved 10 August 2013. ^ "The Ashes 2009: most runs". Stats.cricinfo.com. Retrieved 10 August 2013. ^ "England v Australia at Lord's, 2009". Cricinfo.com. Retrieved 10 August 2013. ^ "BBC Sport – England v South Africa, third Test, day four, Lord's as it happened". Bbc.co.uk. 20 August 2012. Retrieved 10 August 2013. ^ Andrew McGlashan (29 August 2012). "Strauss retires from all cricket". ESPNCricinfo. Retrieved 29 August 2012. ^ "Strauss retirement". BBC Sport. 30 August 2012. Retrieved 30 August 2012. ^ "Agnew on Strauss". BBC Sport. 30 August 2012. Retrieved 30 August 2012. ^ Brett, Oliver (1 November 2001). "Strauss calls the tune". BBC News Online. Retrieved 13 March 2009. ^ "Caldicott School Academic Results 1989–1990". Caldicott School. Archived from the original on 21 May 2010. Retrieved 29 August 2009. ^ Viner, Brian (15 September 2006). "Andrew Strauss: 'I like to think I will have an opportunity to captain the England team again'". The Independent. UK. Retrieved 11 March 2009. ^ a b "Strauss a travelling batsman". Sydney Morning Herald. 14 November 2006. ^ Miller, Andrew (14 July 2008). "Hot water and towels". Cricinfo. Retrieved 15 July 2008. ^ "Andrew Strauss's wife dies aged 46 after cancer battle". ESPN Cricinfo. Retrieved 29 December 2018. ^ "Andrew Strauss takes the blind cricket challenge" (PDF). Primary Club. 22 May 2006. Archived from the original (PDF) on 11 December 2006. Retrieved 11 March 2009. ^ "Middlesex County Cricket Club Profile". Middlesex County Cricket Club. Archived from the original on 1 April 2012. Retrieved 9 March 2009. ^ "No. 59808". The London Gazette (Supplement). 11 June 2011. p. 12. ^ "Ceremonies Unit : Orations for Honorary Awards – Durham University". Dur.ac.uk. Retrieved 30 December 2018. ^ Andrew Strauss (2006). Andrew Strauss:Coming Into Play: My Life in Test Cricket. Hodder & Stoughton. ISBN 978-0-340-84066-5. ^ Andrew Strauss; Scyld Berry (2010). Testing Times: In Pursuit of the Ashes. Hodder General Publishing Division. ISBN 978-0-340-84070-2. ^ Andrew Strauss (4 August 2011). Andrew Strauss: Winning the Ashes Down Under: Winning the Ashes Down Under. Hodder & Stoughton. ISBN 978-1-4447-3622-9. ^ Andrew Strauss (9 October 2014). Andrew Strauss – Driving Ambition: My Autobiography. Hodder General Publishing Division. ISBN 978-0-340-89789-8. ^ Newman, Paul et al. (29 August 2012) Andrew Strauss MP? Will ex-England cricket captain stand for Tories in Corby by-election? | Daily Mail Online. Daily Mail. ^ Glaze, Ben (11 October 2015) Blundering David Cameron 'tried to persuade Ashes hero Andrew Strauss to become Tory MP'. Mirror.co.uk . Retrieved on 24 May 2018. ^ Ross, Tim (12 October 2015). Why the Tories Won: The Inside Story of the 2015 Election. Biteback Publishing. pp. 15–. ISBN 978-1-78590-007-5. ^ "Hampshire v Middlesex, 1998". Cricketarchive.com. 3 September 1998. Retrieved 10 August 2013. (Subscription required (help)). ^ a b "Andrew Strauss batting averages by season". Cricketarchive.com. Retrieved 10 August 2013. (Subscription required (help)). ^ "Middlesex v Northamptonshire, 2000". Cricketarchive.com. 6 May 2000. Retrieved 10 August 2013. (Subscription required (help)). ^ "Cricket Archive profile". Cricket Archive. Archived from the original on 28 February 2009. Retrieved 9 March 2009. (Subscription required (help)). ^ "County Championship Division Two, Middlesex v Leicestershire at Lord's, Aug 30 – Sep 2, 2011". ESPN Cricinfo. Retrieved 31 August 2011. ^ "England in Bangladesh, Oct – Nov 2003 squads". Cricinfo. Retrieved 12 March 2009. ^ Auld, Freddie (6 November 2006). "Strauss – ' I was expecting a Test call-up, not a one-day one'". Cricinfo. Retrieved 12 March 2009. ^ Randall, Nicholas (5 November 2003). "Solanki and Strauss star in England stroll". Cricinfo. Retrieved 12 March 2009. ^ Miller, Andrew (15 November 2003). "Strauss puts the pressure on Solanki". Cricinfo. Retrieved 12 March 2009. ^ "1st ODI: Sri Lanka v England at Dambulla, Nov 18, 2003". Cricinfo. Retrieved 12 March 2009. ^ "Strauss called up to England Test squad". Cricinfo. 5 March 2004. Retrieved 12 March 2009. ^ "1st ODI: West Indies v England at Georgetown, April 18, 2004". Cricinfo. Retrieved 12 March 2009. ^ "5th ODI: West Indies v England at Gros Islet, May 1, 2004". Cricinfo. Retrieved 12 March 2009. ^ Auld, Freddie (2 May 2004). "West Indies cruise to victory". Cricinfo. Retrieved 12 March 2009. ^ "7th ODI: West Indies v England at Bridgetown, May 5, 2004". Cricinfo. Archived from the original on 27 March 2009. Retrieved 12 March 2009. ^ Walters, Mike. "First Test match England v New Zealand". Wisden Cricketers' Almanack. Cricinfo. Retrieved 9 March 2009. ^ Miller, Andrew (19 May 2004). "England braced for loss of Vaughan". Cricinfo. Retrieved 9 March 2009. ^ "Trescothick to lead England". Wisden Cricketers' Almanack. Cricinfo. 19 May 2004. Retrieved 9 March 2009. ^ a b "1st Test: England v New Zealand at Lord's, May 20–24, 2004". Cricinfo. Archived from the original on 21 March 2009. Retrieved 12 March 2009. ^ "Hussain seals victory". BBC. 24 May 2004. Retrieved 9 March 2009. ^ Fraser, Angus (22 May 2004). "Century on Test debut gives Strauss his place in history". The Independent. UK. Retrieved 12 March 2009. ^ Brown, Gavin (6 March 2006). "Cook comes to boil". BBC. Retrieved 28 February 2009. ^ Cook, Alastair (7 March 2006). "Still buzzing after a dream debut". The Daily Telegraph. UK. Retrieved 3 March 2009. ^ "Hussain ponders future". BBC. 24 May 2004. Retrieved 12 March 2009. ^ "2nd Test: England v New Zealand at Leeds, July 3–7, 2004". Cricinfo. Archived from the original on 23 March 2009. Retrieved 12 March 2009. ^ "3rd Test: England v New Zealand at Nottingham, Jun 10–13 2004". Cricinfo. Archived from the original on 19 March 2009. Retrieved 12 March 2009. ^ "5th Match: England v West Indies at Leeds, Jul 1, 2004". Cricinfo. Retrieved 12 March 2009. ^ "8th Match: England v West Indies at Lord's, July 6, 2004". Cricinfo. Retrieved 12 March 2009. ^ "1st Test: England v West Indies at Lord's, Jul 22–26 2004". Cricinfo. Archived from the original on 7 March 2009. Retrieved 12 March 2009. ^ "3rd Test: England v West Indies at Manchester, Aug 12–16 2004". Cricinfo. Archived from the original on 20 March 2009. Retrieved 12 March 2009. ^ "1st Match: England v India at Nottingham, Sep 1 2004". Cricinfo. Archived from the original on 21 March 2009. Retrieved 12 March 2009. ^ a b c d e f g h i j k l m "One Day Internationals analysis". Cricinfo. Retrieved 12 March 2009. ^ "1st Match: England v Zimbabwe at Birmingham, Sep 10–11 2004". Cricinfo. Retrieved 12 March 2009. ^ "1st semi-final: England v Australian at Birmingham, Sep 21 2004". Cricinfo. Retrieved 12 March 2009. ^ "Final: England v West Indies at The Oval, Sep 25 2004". Cricinfo. Retrieved 12 March 2009. ^ "4th ODI: Zimbabwe v England at Bulawayo, Dec 5 2004". Cricinfo. Retrieved 12 March 2009. ^ Brett, Oliver (18 December 2004). "Strauss waltzes into record books". BBC. Retrieved 12 March 2009. ^ "1st Test: South Africa v England at Port Elizabeth, Dec 17–21 2004". Cricinfo. Archived from the original on 20 March 2009. Retrieved 12 March 2009. ^ "2nd Test: South Africa v England at Durban, 26–30 2004". Cricinfo. Archived from the original on 10 March 2009. Retrieved 12 March 2009. ^ "South Africa rock England batsmen". BBC. 3 January 2005. Retrieved 13 March 2009. ^ a b "4th Test: South Africa v England at Johannesburg, Jan 13–17 2005". Cricinfo. Archived from the original on 13 March 2009. Retrieved 12 March 2009. ^ "5th Test: South Africa v England at Centurion, Jan 21–25 2005". Cricinfo. Archived from the original on 19 March 2009. Retrieved 12 March 2009. ^ "England in South Africa, 2004–05 Test Series Averages". Cricinfo. Retrieved 13 March 2009. ^ Langer, Justin (25 January 2005). "Strauss adds substance to style". BBC. Retrieved 12 March 2009. ^ "1st Test: England v Bangladesh at Lord's, May 26–28, 2005". Cricinfo. Retrieved 12 March 2009. ^ "NatWest Series 2005". BBC. 2 July 2005. Retrieved 13 March 2009. ^ "4th Match: England v Bangladesh at Nottingham, Jun 21 2005". Cricinfo. Retrieved 13 March 2009. ^ "Twenty20 International: England v Australia at Southampton, Jun 13 2005". Cricinfo. Retrieved 13 March 2009. ^ "Ponting wary of improved England". BBC. 30 March 2005. Retrieved 13 March 2009. ^ "1st Test: England v Australia at Lord's, Jul 21–24 2005". Cricinfo. Archived from the original on 21 March 2009. Retrieved 13 March 2009. ^ a b "2nd Test: England v Australia at Birmingham, Aug 4–7 2005". Cricinfo. Archived from the original on 10 March 2009. Retrieved 13 March 2009. ^ Haigh, Gideon. "Standing the Test of time". Cricinfo. Retrieved 13 March 2009. ^ Selvey, Mike (6 August 2005). "England hold sway but still fear the genius of Warne". The Guardian. UK. Retrieved 13 March 2009. ^ "England take control at Edgebaston". BBC. 5 August 2005. Retrieved 13 March 2009. ^ "3rd Test: England v Australia at Manchester, Aug 11–15 2005". Cricinfo. Archived from the original on 30 May 2009. Retrieved 13 March 2009. ^ Eager, Patrick. "The abiding image of the summer". Cricinfo. Archived from the original on 7 March 2009. Retrieved 18 March 2009. ^ "4th Test: England v Australia at Nottingham, Aug 25–28 2005". Cricinfo. Archived from the original on 21 March 2009. Retrieved 13 March 2009. ^ a b c "5th Test: England v Australia at The Oval, Sep 8–12 2005". Cricinfo. Archived from the original on 21 March 2009. Retrieved 13 March 2009. ^ a b c "Australia in England, 2005 Test Series Averages". Cricinfo. Retrieved 13 March 2009. ^ "Writer tops Oxfordshire honours". BBC. 31 December 2005. Retrieved 13 March 2009. ^ "Honours for Ashes and 2012 heroes". BBC. 31 December 2005. Retrieved 13 March 2009. ^ "Andrew Strauss and Alastair Cook lead Birthday Honours list". BBC. 10 June 2011. Retrieved 11 June 2011. ^ "Series results England – Test matches". Cricinfo. Retrieved 16 March 2009. ^ a b "Tour match: Pakistan A v England XI at Lahore, Nov 6–8 2005". Cricinfo. Retrieved 16 March 2009. ^ "Tour match: Patron's XI v England XI at Rawalpindi, Oct 31 – Nov 2 2005". Cricinfo. Retrieved 16 March 2009. ^ "Strauss dismisses batting crisis". BBC. 6 November 2005. Retrieved 16 March 2009. ^ "Batting and bowling averages England in Pakistan Test Series, 2005/06 – England". Cricinfo. Retrieved 16 March 2009. ^ "England unlikely to opt for Cook". BBC. 25 November 2005. Retrieved 16 March 2009. ^ "Tour match: Pakistan A v England XI Lahore 7 Dec 2005". Cricinfo. Retrieved 16 March 2009. ^ "1st ODI: Pakistan v England at Lahore, Dec 10 2005". Cricinfo. Retrieved 16 March 2009. ^ "5th ODI: Pakistan v England at Rawalpindi, Dec 21 2005". Cricinfo. Retrieved 16 March 2009. ^ "Batting and bowling averages England in Pakistan ODI Series, 2005/06 – England". Cricinfo. Retrieved 16 March 2009. ^ "1st Test: India v England at Nagpur, Mar1-5 2006". Cricinfo. Archived from the original on 15 March 2009. Retrieved 16 March 2009. ^ "3rd Test: India v England at Mumbai, Mar 18–22 2006". Cricinfo. Archived from the original on 15 March 2009. Retrieved 16 March 2009. ^ "Vaughan set to miss rest of tour". BBC. 2 March 2006. Retrieved 17 March 2009. 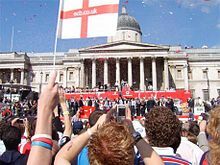 ^ "Violence follows England wash-out". BBC. 9 April 2006. Archived from the original on 14 April 2009. Retrieved 17 March 2009. ^ "Strauss leads way in England win". BBC. 12 April 2006. Retrieved 17 March 2009. ^ "6th ODI: India v England at Jamshedpur, 12 Apr 2006". Cricinfo. Archived from the original on 1 May 2009. Retrieved 17 March 2009. ^ "7th ODI: India v England at Indore, 15 Apr 2006". Cricinfo. Retrieved 17 March 2009. ^ "1st Test: England v Sri Lanka, 11–15 May 2006". Cricinfo. Archived from the original on 2 March 2009. Retrieved 17 March 2009. ^ "England seal second Test triumph". BBC. 28 May 2006. Retrieved 28 February 2009. ^ "2nd Test: England v Sri Lanka at Birmingham, May 25–28, 2006". Cricinfo. Retrieved 28 February 2009. ^ "3rd Test: England v Sri Lanka at Nottingham, Jun 2–5 2006". Cricinfo. Archived from the original on 19 March 2009. Retrieved 17 March 2009. ^ "Only T20I: England v Sri Lanka at Southampton, Jun 16 2007". Cricinfo. Archived from the original on 7 April 2009. Retrieved 18 March 2009. ^ "Batting and bowling averages NatWest Series [Sri Lanka in England], 2006 – England". Cricinfo. Retrieved 18 March 2009. ^ McGlashan, Andrew (2 July 2006). "From bad to hopeless". Cricinfo. Retrieved 27 February 2008. ^ "Strauss named as England captain". Cricinfo. 4 July 2006. Retrieved 19 March 2009. ^ "1st Test: England v Pakistan at Lord's, Jul 13–17 2006". Cricinfo. Archived from the original on 18 March 2009. Retrieved 19 March 2009. ^ "Inzamam helps earn Pakistan draw". BBC. 17 July 2006. Retrieved 19 March 2009. ^ "2nd Test: England v Pakistan at Manchester, Jul 27–29 2006". Cricinfo. Archived from the original on 16 March 2009. Retrieved 19 March 2009. ^ "3rd Test: England v Pakistan at Leeds, Aug 4–8 2006". Cricinfo. Archived from the original on 18 March 2009. Retrieved 19 March 2009. ^ "Lengthy talks fail to save Test". BBC. 20 August 2006. Retrieved 19 March 2009. ^ "Oval Test result changed to a draw". BBC. 3 June 2008. Archived from the original on 5 February 2009. Retrieved 19 March 2009. ^ "Result U-turn for 2006 Oval Test". BBC. 1 February 2009. Archived from the original on 4 February 2009. Retrieved 19 March 2009. ^ "4th Test: England v Pakistan at The Oval, Aug 17–21 2006". Cricinfo. Archived from the original on 21 March 2009. Retrieved 19 March 2009. ^ "Most runs Pakistan in England Test Series, 2006". Cricinfo. Retrieved 19 March 2009. ^ "Only T20I: England v Pakistan at Bristol, Aug 28 2006". Cricinfo. Archived from the original on 31 March 2009. Retrieved 19 March 2009. ^ "3rd Match: England v Pakistan at Southampton, Sep 5 2006". Cricinfo. Archived from the original on 20 April 2009. Retrieved 19 March 2009. ^ "4th Match: England v Pakistan at Nottingham, Sep 8 2006". Cricinfo. Retrieved 19 March 2009. ^ "5th Match: England v Pakistan at Birmingham, Sep 10 2006". Cricinfo. Retrieved 19 March 2009. ^ "ICC Champions Trophy Group Tables, 2006/07". Cricinfo. Retrieved 19 March 2009. ^ "Flintoff named skipper for Ashes". BBC. 12 September 2006. Retrieved 19 March 2009. ^ "Strauss denies row over captaincy". BBC. 10 December 2006. Retrieved 20 March 2009. ^ "Cook hits century in warm-up draw". BBC. 10 December 2006. Retrieved 20 March 2009. ^ Thompson, Anna (16 December 2006). "Awesome Gilchrist savages England". BBC. Retrieved 20 March 2009. ^ a b "Test match analysis". Cricinfo. Retrieved 20 March 2009. ^ Soni, Paresh (26 December 2006). "Warne landmark as England crumble". BBC. Retrieved 20 March 2009. ^ "Strauss cleared after scans". Cricinfo. 4 January 2007. Retrieved 20 March 2009. ^ "Fletcher apologises for big loss". BBC. 27 January 2007. Retrieved 20 March 2009. ^ Smyth, Lance; Rob Smyth. "Wisden 2007 – The Wisden Forty". Cricinfo. Retrieved 20 March 2009. ^ Lillywhite, Jamie (6 February 2007). "England beat Kiwis to reach final". BBC. Retrieved 20 March 2009. ^ "'We can't rest Strauss' – Fletcher". Cricinfo. 25 January 2007. Retrieved 20 March 2009. ^ "2nd Final: Australia v England at Sydney, Feb 11 2007". Cricinfo. Retrieved 20 March 2009. ^ Miller, Andrew (3 April 2007). "Uncertain England once again underprepared". Cricinfo. Retrieved 20 March 2009. ^ Mitchener, Mark (8 April 2007). "Aussies win despite Pietersen ton". BBC. Retrieved 20 March 2009. ^ Agnew, Jonathan (19 October 2007). "Test match Special: Strauss pays price for a poor year". BBC. Retrieved 20 March 2009. ^ "Records / Test matches / Batting records / Hundred in each innings of a match". CricInfo. Retrieved 22 June 2009. ^ "West Indies v England at Kingston, 2009". Cricinfo.com. Retrieved 10 August 2013. ^ "Batting records | Test matches | Cricinfo Statsguru | ESPN Cricinfo". Stats.cricinfo.com. Retrieved 10 August 2013. ^ "West Indies v England at Guyana, 2009". Cricinfo.com. Retrieved 10 August 2013. ^ "West Indies v England at Bridgetown, 2009". Cricinfo.com. Retrieved 10 August 2013. ^ "West Indies v England at Port of Spain, 2009". Cricinfo.com. Retrieved 10 August 2013. ^ Hoult, Nick (22 June 2009). "Ashes 2009: England squad form guide." telegraph.co.uk. ^ "England v Australia at Cardiff, 1st Test, 2009". Cricinfo.com. Retrieved 10 August 2013. ^ "England v Australia at Lord's, 2nd Test, 2009". Cricinfo.com. Retrieved 10 August 2013. ^ "England v Australia at Birmingham, 3rd Test, 2009". Cricinfo.com. Retrieved 10 August 2013. ^ "Dominant Australia take control". Cricinfo. Retrieved 10 August 2013. ^ "England v Australia at Leeds, 4th Test, 2009: Cricinfo commentary". Cricinfo.com. Retrieved 10 August 2013. ^ "England v Australia at Leeds, 4th Test, 2009". Cricinfo.com. Retrieved 10 August 2013. ^ "Strauss's finest hour". Cricinfo. 23 August 2009. Retrieved 30 December 2018. ^ Miller, Andrew (20 September 2009). "Swann saves England from whitewash". CricInfo. Retrieved 20 September 2009. ^ "Statistics / Statsguru / AJ Strauss / One-Day Internationals". CricInfo. Retrieved 20 September 2009. ^ Brown, Alex (17 September 2009). "Strauss laments England's 'horror show'". CricInfo. Retrieved 20 September 2009. ^ "Cook to captain in Bangladesh Tests". CricInfo.co.uk. 18 January 2010. ^ Lillywhite, Jamie (18 January 2010). "Strauss makes 5th Career ODI Century against Pakistan". BBC Sport. ^ "Australia v England, 1st Test, Brisbane, 5th day: England break records in high-scoring draw". ESPN Cricinfo. Retrieved 10 August 2013. ^ Amla, Hashim (27 February 2011). "Cricket Matches: England vs India (Bangalore) (27th February)". Iccworld-cup2011.blogspot.com. Retrieved 10 August 2013. ^ Amla, Hashim (2 March 2011). "Cricket Matches: England vs Ireland (Bangalore) (2nd March)". Iccworld-cup2011.blogspot.com. Retrieved 10 August 2013. ^ Amla, Hashim (6 March 2011). "Cricket Matches: England vs South Africa (Chennai) (6th March)". Iccworld-cup2011.blogspot.com. Retrieved 10 August 2013. ^ "Moores sacked, Strauss made director". ESPNcricinfo.com. 9 May 2015. Retrieved 6 February 2017. ^ "No Pietersen return – Strauss". ESPNcricinfo.com. Retrieved 6 February 2017. ^ "Bayliss confirmed as England coach". ESPNcricinfo.com. ^ "Andrew Strauss: England must focus more on ODIs and T20s". BBC. ^ "Andrew Strauss steps down as Director of England Cricket". Ecb.co.uk. Retrieved 30 December 2018. ^ Berry, Scyld (29 December 2018). "Andrew Strauss' wife dies at 46 after battle with lung cancer". Telegraph.co.uk. Retrieved 30 December 2018. ^ ESPNcricinfo. "Statistics / Statsguru / AJ Strauss / Test matches". ESPN. Retrieved 14 January 2012. ^ "Andrew J Strauss – Test Cricket". Howstat Computing Services. Retrieved 14 January 2012. ^ a b ESPNcricinfo. "Statistics / Statsguru / AJ Strauss / Test matches". ESPN. Retrieved 14 May 2012. ^ a b c ESPNcricinfo. "Statistics / Statsguru / AJ Strauss / One-Day Internationals". ESPN. Retrieved 23 January 2012. ^ a b c "Andrew J Strauss – ODI Cricket". Howstat Computing Services. Retrieved 23 January 2012. ^ a b c ESPNcricinfo. "Statistics / Statsguru / AJ Strauss / One-Day Internationals". ESPN. Retrieved 24 January 2012. ^ "Player Profile (One Day Internationals)". Howstat Computing Services. Retrieved 24 January 2012. Wikimedia Commons has media related to Andrew Strauss. This page was last edited on 4 April 2019, at 11:47 (UTC).